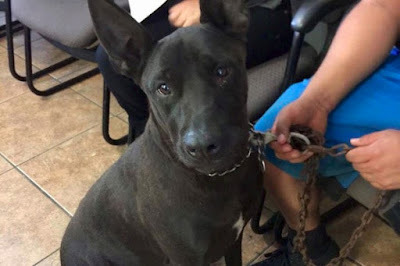 Owner surrendered him to kill shelter because this shepherd had squabble at feeding! Spot is a male Shepherd, NEUTERED, good with kids, people and dogs except around food.. So Spot waits and a waits and waits some more for his turned to be loved ... But nobody seems to care about him. NOT RESERVED - SPOT WILL BE KILLED SHORTLY (if not already) at San Bernardino City Animal Shelter. Spot's owner surrendered him today because dogs had squabble at feeding! Owner cried he loves but has many dogs and sharing food is a problem. A volunteer writes: "I have spent some time with Spot and he's a cutie little pocket pittie! He's a little thin and a little hungry, but his coat is so pretty and look how white his teeth are! He seems very housetrained and he does awesome in playgroups. Spot is a playful guy, returned once and now desperate to find a home that won't give up on him. Please share."